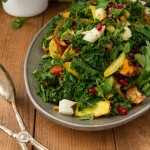 Gluten-free, paleo and vegan salad with curry-infused roasted vegetables in a tart lemon sauce, folded in with fresh coconut meat, kale and pomegranate seeds. Combine sliced fennel, sliced onion, squash, oil, curry powder and half of the lemon juice in a large bowl. Toss to combine then lay out onto prepared baking sheet. Roast in the preheated oven for 35-40 minutes until onions are soft and squash is tender. 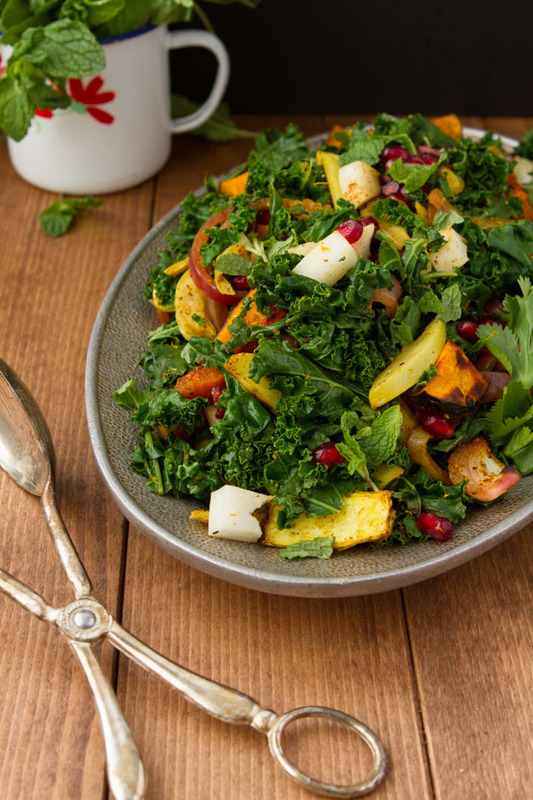 Meanwhile, add very lightly steamed kale, pomegranate seeds, coconut meat, cilantro and mint in a separate, clean large bowl. Set aside. Whisk together oil, remaining lemon juice and salt. Set aside. When fennel mixture is complete, remove from the oven and allow to cool for 10 minutes. Transfer to large bowl with kale mixture and drizzle with dressing. Coconut meat – follow this step-by-step guide on how to open a coconut. If you are looking to add a bit more protein to this salad, cooked chicken, cooked chickpeas or hemp seeds could be added. This recipe complies with Ramp Up Days 1-2 and Wind Down Days 2-3 in my book.